Whether you need a sprinkler head or a valve replaced for your irrigation system, Giving Hope Lawn Management is the company to call. We offer fast and professional repairs for all lawn sprinkler systems whether we installed it or not. Sometimes it’s easy to forget that our lawn irrigation lines aren’t as durable as our plumbing system. 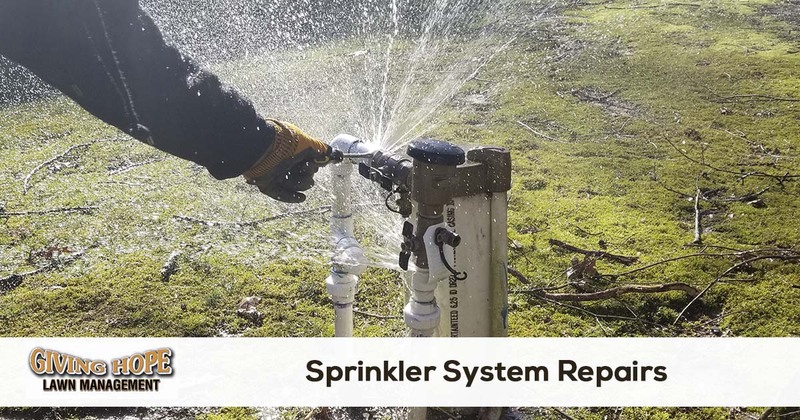 Over time, every yard will require sprinkler system repairs. Even the most efficient irrigation systems develop leaks, and broken sprinkler heads just waste a ton of water. Worst yet is when they’ve remained ignored for weeks! When you require fast and affordable irrigation system repairs, Giving Hope Lawn Management is still the best choice in Richmond, VA. We’ve repaired more area sprinkler systems than anyone else since 2011! Our company has the professional experience you can trust to handle any repair need. When you need functioning sprinklers now, you need us to help you! Call today for your best irrigation system repairs. We’ll have your lawns watered again fast! No matter the reason why your sprinklers aren’t operating at their best, we will have the affordable solution each time. Call today for your best sprinkler system repairs! Some residents may think that sprinkler system problems mean that they need an entirely new system installed. But most of the time, irrigation issues can get solved with simple answers! More often than not, it’s likely an isolated sprinkler head or a line that got clogged with mud. In these situations, we can fix it in a matter of minutes. Even more extensive corrections, like new water reservoirs or better trenching, shouldn’t take too long. When you call us for all of your sprinkler troubles, we always have a fast fix each call! Whether you have sprinkler heads with broken springs or split watering lines, we can help you enjoy better-watered lawns for less. When you need to save on quality repairs without sacrificing quality, you need us to service your yards! Contact us to hear how we can help you save on your best irrigation systems. Keep your home and business greener for less! Most homeowners think they can save a few dollars by correcting their issues themselves. However, after the third trip to the hardware store, they start to regret their decision! While most sprinkler system parts are inexpensive, you likely need to buy a lot of them. That means even cheap fixes add up fast. Instead, we have everything we need to complete your job. There’s no need to get stuck in traffic again when you call Giving Hope Lawn Management first! The best and fastest sprinkler system repair services, call Giving Hope Lawn Management. We offer free quotes, make it easy to schedule service and offer a 100% satisfaction guarantee.